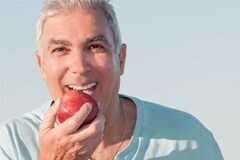 There are few (if any) dentistry services more complex than dental implant supported tooth replacement. While this multi-phase treatment process can seem daunting, the end result is well worth the extra steps. Instead of just replacing the visible portions of the smile with a traditional tooth replacement prosthetic, dental implants let us replace the roots of missing teeth, delivering flawless, natural function and stability. In order to help you better understand the complexities of dental implant tooth replacement, we always begin your treatment with a thorough tooth replacement consultation where we’ll describe every step of the implant tooth replacement process. Our goal is to ensure you feel completely confident in your treatment plan before we begin. To learn more about dental implants and your tooth replacement options, call Aesthetic Dentistry of Wickford to schedule your consultation in our North Kingstown dental office. During your dental implant consultation, we’ll review all of your treatment options, including dental implant supported restorations. You may think that dental implants are your best options, but we want to make sure you understand all of your possible treatments before we move forward. We’ll want to review your oral and overall health history, past surgical experiences, and other factors that may impact the success of your implant supported tooth replacement plan. 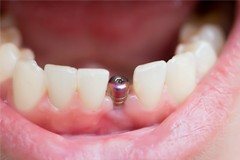 If we determine that dental implant supported tooth replacement is the right options, we still may need to perform one or more preparatory services before we begin your treatment plan. These procedures may include tooth extractions, tissue grafts, and any other services that will improve your chances for successful dental implant placement and restoration. Once the preparatory procedures are complete, we’ll need to surgically place the dental implant posts. This procedure is typically very straightforward. We simply make an incision into the soft tissue. Then, the implant post is inserted into the jawbone. 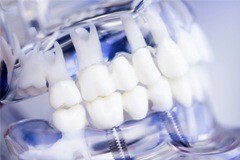 After the dental implant posts are placed, the osseointegration process begins. This is the technical term for the way the implant posts fuse with bone and gum tissue to mimic the healthy, natural structure of tooth roots. Depending on the individual patient, the osseointegration process can take anywhere from three to six months. Once the implants are firmly in place, we will attach abutments that are used to attach the replacement teeth to the supportive implant posts. After the abutments are in place, we’ll capture bite impressions that are used to design the custom dental crown, bridge, partial, or full dentures. The custom design is sent to our dental lab where your flawlessly designed restoration is hand-made to fully renew your smile. The final step of the process is the placement of your beautiful new smile. After we receive the restoration from our lab, we’ll attach the replacement teeth to your abutments, recreating the lost tooth structure and function.